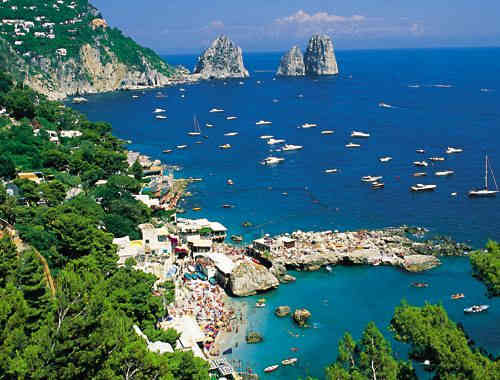 Charming local towns and extraordinary hospitality open the island's beauty to many visitors from all over the world and it was the world's most famous writers who stayed in Capri and who, enchanted by it's charm, favoured it's rediscovery and popularity with international tourism. 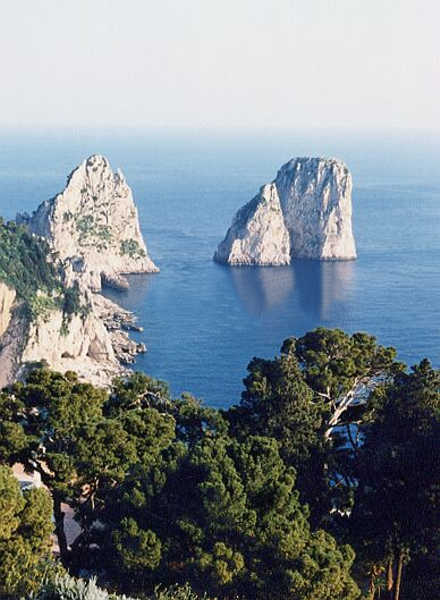 Capri in fact has been sought out by numerous writers and scholars. Of the many men of letters from various countries who came to this Tyrrhenian island in search of inspiration for their great works of literature the Swedish physician Axel Munthe deserves special mention; needless to say, many other famous names from world literature can also be found here. 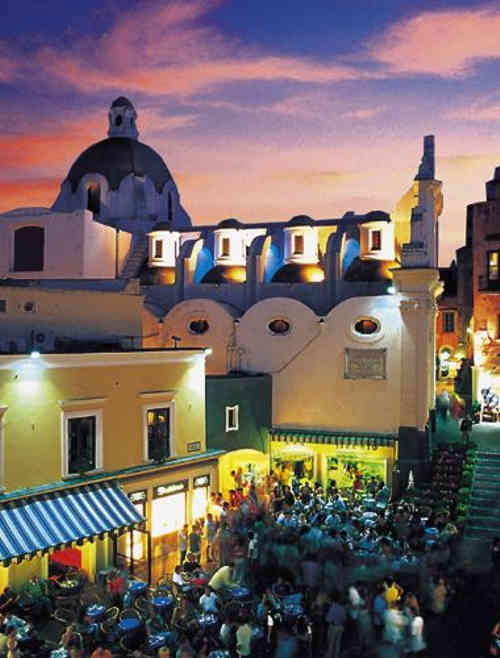 A town neighbour of Capri and captivating vacation resort is Anacapri, surrounded by Mediterranean country side of exceptional beauty it is set at the feet of Monte Solaro, an unforgettable lookout point, that can only be reached from this town with a chairlift or by foot trail. In early days these two towns were not connected by any road but only by a stair case "Scala Fenicia" that climbs steeply to the "Castello di Barbarossa" castle. 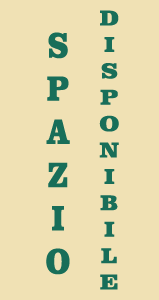 Nowadays the simple road network that runs along the main axis between Capri and Anacapri has few side roads and can only be travelled by local residents; the island has just been declared a pedestrian zone, especially as a means of protecting the countryside. The medieval suburb dominates around the square, it is very interesting from the historic-urban point of view and it is characterised by narrow and tortuous alleys. Almost all the space is taken up by the tables of the numerous cafes, bars and "ice cream houses, producing the feeling of a big, open air, wonderful drawing room. This Island once had no natural ports and was only accessible by a small beach, but in time the two Marina Ports were built, the "Marina Grande" and the "Marina Piccola". The first one was firstly built on the western coast with Roman Origins, today lies more towards the east and docks the daily ferry boats and hydrofoils coming from other resorts as well as yachts and most beautiful sailing boats especially during summer months. The second port instead originated as a group of coral fisherman's houses dominating two small beaches made of gravel near an old docking bay with Roman origins. Since the '30s it developed thanks to the attention it drew by sea tourism. On a rise not far from Capri is "Santa Maria del Soccorso" with its beautiful panorama of the Sorrento Peninsula and the ruins of Villa Jovis. 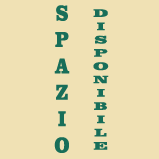 This typical example of Roman villas is commonly known as the "Palazzo di Tiberio". Legend has it that Tiberius himself ruled the Roman Empire from this villa, and the entire area abounds with sagas and legends about the Roman Emperor. 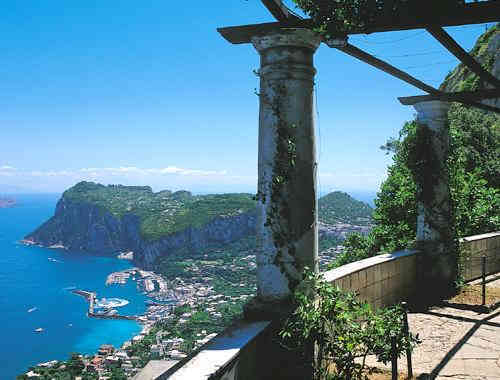 The Faraglioni are certainly Capri's best renowned feature all around the world. They are the result of a peculiar natural phenomenon, the collapsing of a sea cave in fact that adapted to mother nature's effects like wind and rain. 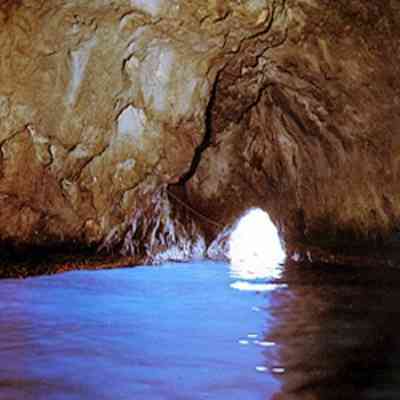 In fact the term "Faraglione" is generic, although nowadays it only seems to recall these fantastic features of Capri, attracting all kinds of tourists to this island and to the rest of the Amalfi Coast. This term, however, originally described a geological formation of high sheer cliffs that have strongly been moulded by the sea and the wind causing a partial or total isolation from mainland. The characteristic feature of these cliffs that can be formed either by limestone or have volcanic origin, is always the strong erosive action of the sea that models the rock into bare, sharpened masses. In ancient times when electricity was out of this world, the Faraglioni were used as a rustic kind of lighthouse! In fact fires were burned on top of these cliffs as well as other coastal high places and spots to guide ships, especially during nights of a "new moon". Greek and Roman sailors always used to sail along coasts whenever possible as their boat construction techniques were unsuitable for deep sea navigation. This, however, exposed them to high dangers of running aground on sandbanks or hitting rocks in fact shipwrecks were not uncommon. The inventive people of those times decided to adopt signals on the rocks and cliffs that lay off the coast guiding the ships off mainland and almost safely ashore. The name "Faraglioni" is in fact derived from ancient Greek and other Roman place names containing the little word "pharos" that means lighthouse. The most famous of the three remaining villas erected by the Roman Emperor, whom legend has sheathed in mystery and ruthless violence, undoubtedly is the "Villa Jovis" (Jupiter's Villa), which commands a view of the entire Gulf of Naples from its location a top the Capo. It is said to have been the residence of the Emperor Tiberius himself. The remains of another villa are located in "Damecuta", while other findings dating back to the Imperial Rome can still be found near "Case Palazzo a Mare", the site of the "Bagni di Tiberio" (Tiberius' Baths).